The Kona County Farm Bureau sponsors the Keauhou Farmers Market in order to support agriculture in Hawaii. If you are interested in becoming a vendor, please fill out the vendor application form. We grow and sell fresh gourmet lettuce, watercress, arugula, kale, herbs, other vegetables and tropical fruits. We do not use GMO seeds or chemical pesticides. Freshly caught fish, island fruits, vegetables. Our diversified and certified organic family farm is about growing and making what we need from the land! At the market we offer 100% Kona coffee, fruits including avocados, lulos, oranges, papayas, etc., and vegetables that include taro, tropical greens, and tropical (kilimanjaro) basil, as well as jams from our fruits and baked goods with our fruit – passionfruit scones and muffins. Share and enjoy the freshness and bounty of our abundant (kanalani) family (ohana) farm. Visit Kanalani Farm for more information. Hawaiian Mamaki tea, locally grown, mamaki iced tea; Hawaiian medicinals. Kona Community Gardens harvest 30+ farms across Kona providing a market for farmers to sell their produce to the community. We work with only farmers that use organic methods to grow their food. Flavored macadamia nuts, macadamia nut butter and macadamia nut brittle, avocados and tropical ice cream. Visit our website, Ohana Farm Orchards, for more information. Certified organic 100% Kona Coffee, fruits. More information can be found on our website, Rancho Aloha. Variety of lettuces, European and Asian greens,other vegetables, herbs, seedlings, edible flowers, plants and fruits. I use a variety of practices chosen from organic and natural farming, and personal research and experience - the goal being healthy and sustainable food production. Tomatoes, cucumbers, fruits and other vegetables. Jean and Danielle Orlowski control every stage of the coffee process with boundless passion and exceptional attention to detail. They are proud to sell the finest Kona coffee available. USDA-certified organic, direct from their fields in the sunny hills of Hawaii. Christmas Berry Honey, Bee Bread, Bees Wax. 100% Kona Coffee, jams, and jellies. Macadamia nuts, avocados, fruit, baked goods, greens and fresh herbs. Visit Kona Hawk Farms for more information. Fine quality baking since 1993. Market fresh smoothies and homemade granola. Offering fresh and super healthy food for the community with organic ingredients straight from the farmers market. We have a beautiful Certified Organic farm on which we grow 100% Kona Coffee, Macadamia Nuts, Tropical Fruit, Produce and Hearts of Palm. We grow and hand make our own Kona Chocolate, tropical dried fruit, tropical pastries, Jams and Macadamia nut butters. We also have farm fresh eggs every week from our happy hens! Visit our Facebook Page for the latest updates. Hawaii Kombucha is a nano-brewery in Kealakekua on the Big Island. We are dedicated to the freshest & highest quality kombucha ever brewed. Our mission is to bring this clean, living, ancient energy beverage to the forefront of humanity, all while exercising sustainable agricultural, ecological, and business practices. Visit www.hawaiikombucha.org for more information. Living Lettuce and herbs, micro greens, wheatgrass, bok choi, green onions, beets, radish and other root veggies, Aquaponics gardening training courses. Visit Living Aquaponics for more information. J&D Farm sells lei and cut flowers, asparagus, succulent gardens, zucchini, Christmas cactus and now offering Hamakua Mushrooms. Apple bananas, fruits, cacao, chocolates. Visit Kona Origins for more information. Macadamia nuts, 100% Kona coffee. More information on our website at Joe's Nuts. Tai Shan Farms is a producer of Dragon Fruit and Honey. 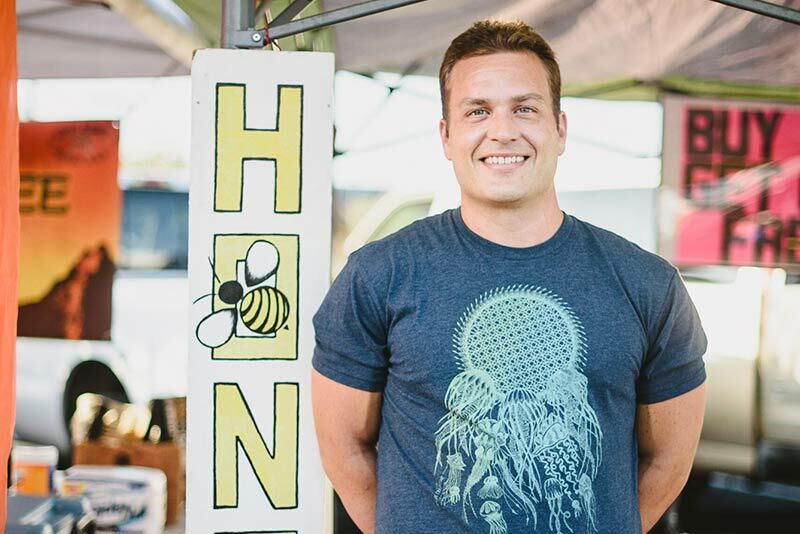 Our products are artisan baked goods made from fresh honey from our own bee hives. We also sell hot sauces, salad dressings, cocktail mixes and jams, all made with dragon fruit and/or honey from our farm. We also sell a variety of honey and honey melanges.